Quince, the once beloved, but then largely forgotten orchid staple, is making a comeback in a big way. And why wouldn’t it? With colorful crepe-like flowers, a relatively small size and a great big pectin punch, quince is the perfect fruit for the orchardist who makes their own jams and jellies. 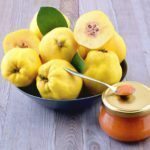 But it’s not all fun and games in the world of jelly; it’s also important to know a little bit about the common diseases of quince trees so you can catch them before your quince becomes seriously sick. Treating a sick quince is much easier if you can do it in an early stage of illness. Read on to learn more about common quince disease problems. Fire blight. Pear growers will be familiar with fire blight. This bacterial nuisance is also a problem for quince. You may notice blossoms appearing water-soaked or rapidly wilting. Nearby leaves follow, wilting and darkening while remaining attached to the plant, giving it a scorched appearance. In wet weather, infected tissues may ooze a creamy liquid and mummy fruits remain firmly attached after the end of the season. Often, you can cut out the infected material, rake up all fallen debris to prevent reinfection and treat your plant with copper sprays during dormancy and again just prior to bud break to end the cycle. It may take a few years of diligence, but your patience will be rewarded. Leaf spot. There are several leaf spot diseases that can affect quince. They may appear as large or small spots on leaves, but are largely cosmetic in nature. The best plan is to clean up all fallen debris from around your tree to remove any fungal spores, prune the inner canopy to increase air circulation and, if the spots are plentiful, spray with a copper fungicide when leaves emerge in the spring. Powdery mildew. Powdery mildew is a fungal disease that looks like your plant has been lightly dusted with powdered sugar in the night. 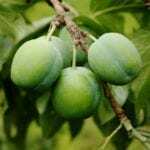 In ornamentals, it’s not a serious disease, but in fruit trees it can cause dwarfing, distortion and scarring of new growth, even damaging the fruit itself. It’s definitely something to treat. Luckily, you treat it just like leaf spot. Open up the canopy, increase the airflow around each branch, get rid of any debris that might be harboring spores and apply a fungicide to help kill the fungus back.